This Sunday’s Sample is Because of Rebecca by Leanne Tyler! Here’s the Sample from Leanne’s romance. Thanks for being our guest, Leanne, and sharing your sample. 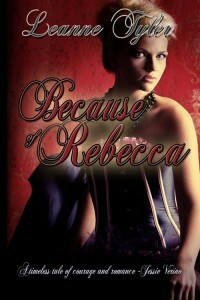 Because of Rebecca will be free on Amazon from March 19th – March 23rd. Rebecca felt her cheeks flush warm and she looked away lest he see the effect his touch, both physical and visual, had on her. She didn’t understand the perplexing effect he had on her either. Sometimes she felt as if she’d burn to an ember on the inside from an innocent touch or glance. Jared pushed his chair away from the table. “Yes,” she said far too eagerly, but she…they…needed a distraction, if he felt anything like she did when they were alone. She waited as he stood, pulled back her chair, and offered her his arm before leading her into the foyer. His golden hair still hung in wet curls around the collar of his crisp white shirt. Standing this lose she could not help but inhale the clean, spiced soap scent and heat threatened to flame her cheeks once more as she imagined him in his bath. Rebecca smiled, her heart beating faster with each step. She naughtily thought about him bathing, water glistening on his rock hard body. Even though he was dressed, she couldn’t stop sneaking a look at him. She imagined his skin was just as tanned underneath his clothing as above. He no doubt removed his shirt when working in the hot fields, letting the sun bake him. Her desire to touch him was strong. Her mouth felt dry and her heart beat a little faster. She missed her footing on the next step and stumbled forward, but he caught her, helping her right herself. “Are you all right?” he asked when they reached the landing. Embarrassed, she looked away and nodded. She didn’t understand what made her lose all propriety when she was around him. They’d just met, but she’d simply die if he didn’t feel anything for her. She felt like a silly goose allowing herself to hope that he did. She stepped closer to him and laid her hand on his chest. He blinked and she saw the surprise in his eyes that she’d touched him. Her unexpected touch seared his flesh and he hesitated a moment trying to read her thoughts before he answered. “Yes. I like you. Why do you ask?” He could feel the rise and fall of her breasts as she stood so close to him. Her emerald eyes were dark and her lips were pink, inviting him to taste them if he dared. With his free hand he cupped her cheek, caressing it gently. He rubbed the pad of his rough thumb over her lips. They trembled in response and he lowered his head, nibbling at her mouth with small kisses until she responded in kind. Without warning, he parted her lips with his tongue and captured her mouth, exploring its depths. Her hand crept up his arm to his neck, holding his head so he couldn’t pull away. Her fingers speared through his damp hair, sending shivers down his spine. His body hardened and he groaned, pulling away before he lost his head completely. He walked toward the French doors on the opposite side of the library afraid she might see what had started out as an innocent kiss had done to him. He didn’t want to frighten her, or make her think he was on the verge of losing control. Startled by her reckless behavior, Rebecca didn’t know what had gotten into her asking such a question. Sometimes I wonder if pursuing a writing career is a pipe dream or a lost cause. It’s seems to me I’ve been working hard at this for a very long time. Anybody else ever feel this way? I’ll bet there’s more than one person in any crowd who knows what I mean. You work hard, write every day, watch for opportunities and then get nothing returned but rejections and sometimes, they don’t even bother to let you know they’re rejecting you. . . they simply ignore you. It’s a hard life, and a constant struggle, but since I’m going to write whether I get published or not, I grues what “they” think doesn’t really matter. I’ve often asked myself why I do it, keep writing that is, why would I put myself through so much for so little. It’s because I have nothing to lose, and everything to say. I believe there’s magic in some of those stories, and someday you may want to read them. It doesn’t have to be today, but someday is good enough. Oh, and that is what writers do; they write, whether you’re reading or not. So jump on in here and tell me, what do you have to lose? Cal needed to intervene. But the timing needed to be perfect. Scott spent the afternoon working on the lighting in the grand entryway. He knew there was a hidden panel which, once revealed, would present him the treasure he sought. He knew the gold was here, he simply needed to find it. Before the job ended, which was way too close. Cissie told him the job would end when the B&B opened–whether he was finished or not. Normally he’d wouldn’t pay any attention to single women trying to get him to commit to something like that. He just didn’t do it. Nobody pushed Scott into commitment. Nobody. Except Cissie made him sign a contract. So once the B&B opened, his was history. She wouldn’t have any trouble getting someone else out here to work once the public started showing up. The solitude would only last as long as they were alone. Scott wanted the job to be done. This old house was really getting under his skin. He’d been creeped out several times the past week, constantly feeling as if someone was watching over his shoulder. And the tools. That was freaky. He’d put down a hammer, or wire cutters and when he went to grab them again, just a second or two later, they’d be gone. He was being toyed with or losing his mind. Probably not. Just the stress. He was anxious to get back into town tonight. He had more research to do, and he needed to go by the library before it closed. Besides, the young librarian was fairly hot. She’d come onto him the last time he’d stopped in there. Maybe he’d get lucky. Clouds drifted across the late afternoon sun, causing a shadow to creep across the stairs. Cold chills fingered their way down his spine and he looked up to find Cissie watching him from the foot of the stairs. “What are you doing?’ she asked. “Um, checking out the outlet here.” He pointed to the top of the staircase. He’d added an outlet so the maid wouldn’t have to plug-in a vacuum in a guest room. He’d insisted on adding the outlet, easily explained and not on the original plan, so he could search for panels on the staircase. He’d already exhausted his other options in the attic, basement, dining and kitchen areas. The great rooms and the reception hall offered no place where hidden panels might conceal the Colonels stash. As she turned on her heel to return to the kitchen she dropped the letter opener. Scott ran down the stairs and grabbing her by the waist, reached around her to retrieve it. Cissie yelped in surprise and pulled away, knocking a vase of flowers off the entryway table. The crystal shattered and the water ran in rivulets from the table to the hard wood floor at their feet. Cissie pushed him away and he slipped in the water, hand clutching the letter opener. His legs went out from under him and his arms windmilled with the letter opener connecting with the electrical outlet at the same time the storm began in earnest. Lightning struck the rods on the roof of the old mansion and the charge traveled down from the roof through the house. Every electrical outlet, old and new exploded in a flash. Snap, crackle, pop. Light bulbs popped, current slid across any available surface, and appliances unfortunate enough to be plugged in, immediately blew out. When Scott landed, with the letter opener in his grip connecting with the outlet at the foot of the stairs, he began to jerk and flop like a trout on the shoreline deprived of air. Cissie could only watch in horror.